Jesse Lane, under jockey Alonso Rivera, gets up to win the $202,547 New Mexico Classic Cup Derby(RG2) Sunday at Zia Park. HOBBS, NM—NOVEMBER 4, 2018—After a light bump at the start, Jesse Lane got up at the wire by head over Hollywoodcrown in the $202,547 New Mexico Classic Cup Derby(RG2) Sunday afternoon at Zia Park. Ridden by jockey Alonso Rivera, posttime favorite Jesse Lane rolled over the 440 yards in :21.734 seconds, a 96 speed index into a 16 mph headwind, to get his third consecutive win. 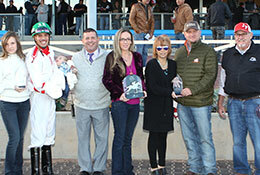 The $97,224 winners' purse boosted his career mark to $297,496. Trainer James Padgett, II conditions the New Mexico homebred son of Jesse James Jr for owner/breeders MJ Farms. Out of the Lanes Leinster mare Champagne Lane, Jess Lane has compiled an (11) 5-3-0 record that includes winning the All American Juvenile and finishing second in the RG1 Zia Futurity at Ruidoso Downs last year. Racing for owner-trainer and breeder Fred Danley, Hollywoodcrown led early but was out-finished by the winner. Jockey Porfirio Cano rode the daughter of champion sire Heza Motor Scooter from the thoroughbred mare Hollywood Gone by Gone Hollywood. 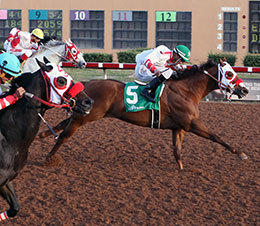 The $34,408 runner-up check brings multiple stakes-placed Hollywoodcrown's earnings mark to $ 160,933. Bouncing off a fourth-place effort in the October 14th trials, Ginuwine Buzz finished 1-¼ lengths off the leaders to collect $16,710 for third. Beatriz Sanchez conditions the daughter of Genuine Strawfly for owner Pedro Carrillo. Bred by Jill Giles, from the Corona For Me mare Reacorona, Ginuwine Buzz has banked $73,518. Joseph Belloc, Jr. was up.